There is only one place in Las Vegas where you can find a complete golf experience, and that place is Lake Las Vegas Resort. Here, you can discover award-winning golf with views that are completely unexpected and revered. On the shores of a majestic lake, sculpted out of desert and mountainside, lie some of the most challenging yet rewarding courses ever created. Visit us to learn why USA Today named Lake Las Vegas Resort one of "America's Top 10 Golf Resorts!" Sculpted from the rugged desert terrain of Southern Nevada, Lake Las Vegas Resort lies nestled within the desert mountainside just seventeen miles from the world-renowned Las Vegas Strip. Boasting world class hotels & spas, championship golf, an exclusive retail village with first-class dining, shopping, entertainment and an intimate casino, Lake Las Vegas Resort offers guests and residents alike an unmatched golf experience designed around Las Vegas' only privately-owned lake. Lake Las Vegas Resort offers a variety of instructional programs that can be assessed in a number of 1/2- to 3-day formats. Group or private lessons are available and all lessons are provided by a PGA Professional at the Reflection Bay Golf Course. 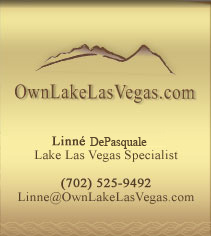 Lake Las Vegas provides guests and residents ample oppportunites for fun and recreation inside of the community. Whether you are looking for the excitement of a world-class Las Vegas Casino, a quiet day of spa treatments, a relaxing day of fishing, birdwatching, sailing, or hiking, or a step back in time to play in a quaint Tuscan village, Lake Las Vegas will exceed your expectations. Las Vegas is known as 'The Entertainment Capital of the World' for good reason. There are so many incredible sights and attractions in this great city -- and many do not include gambling. We here at OwnLakeLasVegas.com have assembled a few suggestions of our favorites in and around Las Vegas. It is no coincidence that a large number of these naturally beautiful destinations are so close to Lake Las Vegas Resort. "It took me seventeen years to get 3,000 hits in baseball. I did it in one afternoon on the golf course." Gary Knapp, a PGA Professional and Lake Las Vegas Director of Instruction, has been teaching golf for 23 years. and more. As one of the initial members of the Nicklaus/Flick Golf School in 1991, Gary was an integral part of helping to sculpt the school into the top-rated program of its kind in the country. In 1993, Gary helped establish and train instructors for the Jack Nicklaus Golf Academy in Manila. In 1994-1995, he was in charge of training golf instructors for Jack Nicklaus learning centers worldwide. In 1996, he served as Director of Instruction for the first Jack Nicklaus Golf School in Sydney, Australia. Knapp was voted Teacher of the Year in 2000 in the South Florida Region. Lake Las Vegas is pleased to present such an esteemed lifelong scholar and instructor of the game of golf. View the Lake Las Vegas Golf section of OwnLakeLasVegas.com for more information about Instruction Packages and Institute information.